Hi there everyone today I am posting a card that I taught at our Close To My Heart Consultant Team Meeting this month. This card was done using the “Reflection” technique. The card is an A2 size card (4-1/4 X 5-1/2) and is used as a top fold. Emboss the front of your card with embossing folder of your choice (holly leaves and berries or snowflakes are great choices. Cut an oval at 3″ (page 42) and the decorative layer oval at 3-3/4″ (page 52). 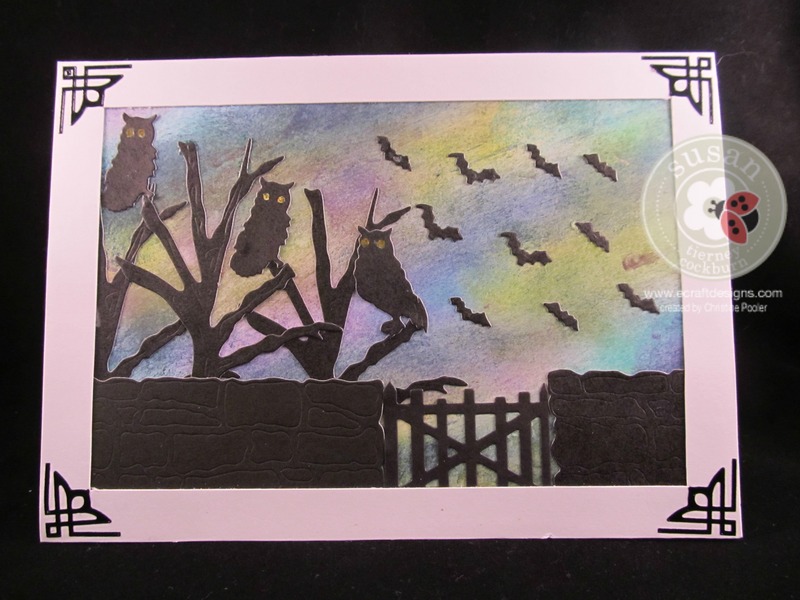 (The ones used on this card were cut on the Cricut using the CTMH cartridge Art Philosophy). Using light blue ink (CTMH – Glacier used here) sponge over the oval lightly. Attach the oval to the card front and then using pop dots to attach the decorative oval over the stamped oval. Punch a scalloped oval from black cardstock and a coordinating oval from white cardstock (Stampin Up punches used here). Attach the oval to the scallop oval. Stamp with “Merry Christmas” or other sentiment on white oval (CTMH stamp set “Holiday Tags” used here). Cut a set of Holly leaves at 1-1/4″ from green cardstock using the CTMH Cricut cartridge Artistry. Shape a little and attach to the scalloped oval. Add 3 little red sparkles for berries. I do hope that you have enjoyed this tutorial and it inspires you to try your hand at this “reflection” technique it is fun to do. Hello everyone today I am posting a card that I designed for Susan Tierney-Cockburn’s Design Team at Elizabeth Craft Designs. This is something a little different than what I normally do (I am really a flower person) but Susan has all these great dies I wanted to try out. The background for this card has the “Northern Lights” technique. You usually use this technique with silhouette stamps but I chose to use Susan’s Garden CountryScape dies and build my silhouette from die cuts. 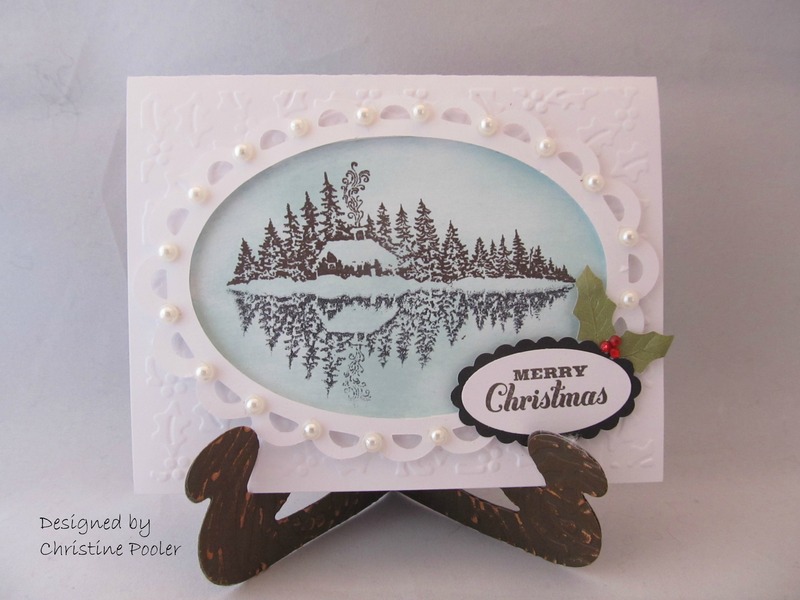 You can find the tutorial for making this card on Elizabeth Craft Designs blog found here. Once here scroll down and you will find my tutorial. Please hop on over to Elizabeth craft Designs and see all the wonderful products that they offer. Hello today my post is a card I designed for Susan Tierney-Cockburn’s Design Team at Elizabeth Craft Designs. I have again used Susan’s Chrysanthemum I really love making these “Mums” they are lots of fun. I have used microfine glitter on this card but it is very hard to see the glitter in the picture. The card is displayed on the new Card Stand / Easel made with the new Elizabeth Craft Designs die. I am loving this stand and including it with my cards when I send them as it is great for the recipient to be able to display their card. The card base is a standard A2 card 4-1/4 X 5-1/2 with a top fold. 1 Using white cardstock cut at 4-1/2 X 5-3/4″ cover with clear double sided adhesive cut 1 panel from the accordion oval die – cut away the oval and tabs. 2. Remove protective paper from the adhesive and cover with Saffron micro fine glitter and burnish in. 3. Cover a 5 X 6″ piece of white cardstock with clear double sided adhesive and cut 1 set of oval flourish frame edges. remove the protective paper and adhere to the glittered panel. Attach panel to front of card base. 4. 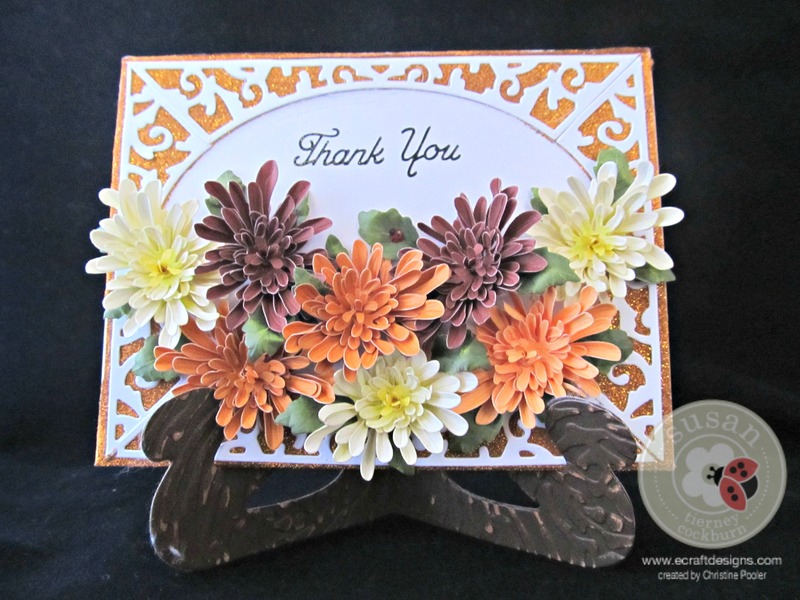 Using several different colors of cardstock cut and shape 8 “mums” following Susan’s Youtube video found here. 5. Adhere flowers and leaves to lower half of the oval on card front using a clear drying adhesive. 6. Attach “Thank You” pull off sticker to top half of oval. 7. Create the new card stand / easel video found here. I do hope that you have enjoyed this tutorial and now you will give it a try. Be sure to visit Elizabeth Craft Designs to see all the products they offer.